Clairey, some pairs just bicker. Snick and Ouiser were very loudly conversational their whole life together, but I don't at all believe they weren't perfectly happy together. Well, Snick was happy, and Ouiser would have preferred that he pick up his socks and help out with folding things. But you know what I mean. Yeah, I know. And I do need to keep reminding myself they're young. Simon's barely 2 at most and Graham is a little younger. So they're still all slamming doors and youthful theatrics. I bet some pigs could be trained to use a flap door thing. Simon likes to nose the kitchen door open when I'm in there so he can remind me that he's (always) hungry. All of my pigs have each had a particular way they like to be petted and I've finally found Simon's. He likes a light, circular massage down his spine. I coaxed a purr out of him as he melted into the floor. :) Graham has a big tuft of hair right below his shoulder blades that's like his on/off switch. It's super-sensitive to touch and makes him twitchy if I brush past it but if I work it down flat with my fingers, he gets all dopey. We have progress! It's not snuggling but until a few days ago they couldn't possibly lie this close for much more than a couple of minutes. Either Graham would flash teeth or Simon would retreat before he had the chance. At the moment they've been snoozing like this for a good 45 minutes and it's becoming normal. And pellets can once more be served in a bowl without anyone being threatened or bullied. They feel a lot more balanced now as a pair. :) Graham is still a twit but Simon seems to be growing to quite enjoy him. Heartwarming! So cute at the pellet bowl. Simon is summoning (demanding) you to fill the bowl with pellets immediately instead of busying yourself with that contraption with the annoying flash. Yes Graham has the abby-tude and those abby's can be such twits. Oh he so does! He also got a bit carried away with suddenly finding himself the top pig and his very top pig-ness had to be reinforced at every and all opportunity. I can't praise Simon enough for not rising to the constant bait. There were times I felt Simon was being really bullied but then he would sprawl out and nap somewhere that a wary or harrassed pig just wouldn't, eg. the middle of the cage or the favoured bed. Good for Simon. Mr. Chill! Simon is not fazed one bit, after all there are more important matters to attend to, such as sleeping. I think Simon is defying Graham's bully, abby-tude behavior by just being Simon. I miss my Stephen and Bobbins so much still. Suddenly having 2 pigs I don't know that well (and that aren't old enough to not know themselves very well either!) has been strange and quite frustrating at times. However, G-Force and Agent Orange have brought a lot of fun and energy to the place too. They tease each other then zoom and popcorn around the room. It's like Simon is learning all this social stuff (slowly) for the first time. They do seem to have an agreement about time out though. I've noticed that when the chasing gets too much, Simon will dive into a corner of the hay bin or a bed and stand his ground with a rumble and some whining. Graham backs down then. It's not a threatening stand off, more like 'free den' or 'home' when you're playing tag. Seeing that they have some order to their romping (and it's not all Graham simply steam-rollering Simon) was such a relief. ETA: Simon is sporting a bald stripe down his dewlap just now. It's been a while so I panicked at first but it can only be a boar glue mishap. Both pigs only finished mite treatment a couple of weeks ago and there's no broken or flaky skin, just a neat totally bald bit. Oh crumbs. I adopted Bobs 3 years ago today. http://www.guinealynx.info/forums/viewtopic.php?p=2056584#2056584 I hate that 'Memories' feature on Facebook. It's hard to believe I only had Bobs for less than 3 years. Bobbins did not grace us with his presence long enough, clairey. That is an undisputed cosmic fact. I remember when his med thread first popped up over in the emergency forum and I discovered your chronicle. Reading back through it all, it seems more a matter of months than years since that little boar sashayed into all our hearts and plopped himself down there. 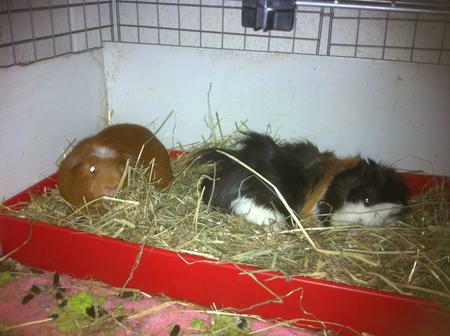 Meanwhile, just love, love, love the photo of Mr Graham crashed out in the hay box. And, *G-Force*? Agent Orange? Love it. Perfection. Yes, great names for great pigs! And we need more photos to confirm that all is well piggdom. Their fans are waiting. I know. Sadly it's that time of year where Scottish 'dayight' is merely a slightly lighter grey than 'dark' and rarely comes inside far enough to make decent pics possible and flash kills the moment. I'll try. 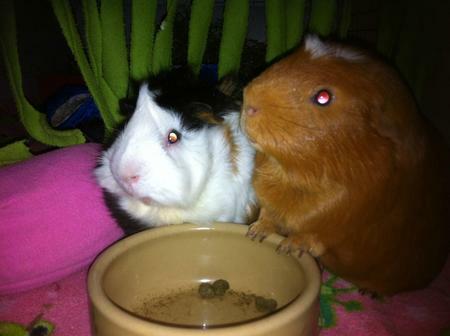 I need to try to capture them begging at the side of the cage. Simon's head tilt gets more exaggerated the higher he holds his head from the ground. Because of this, I've never encouraged him to get up on his back legs. However Graham is a master beggar and Simon decided to copy him.